The Z1 Dashboard software offers several special dashboards. These include the timing and scoring dashboard (discussed here), the telemetry dashboard and the track map dashboard. Each of these dashboards provides detailed information that can be used to augment or replace the information included in the car's main dashboard. The Timing & Scoring dashboard is included by default in the rotation of dashboards for the first instance. It is also the primary dashboard for the third instance. You may alter these settings as described in the Car Settings page. However you choose to display this dashboard, the information is the same and is described below. 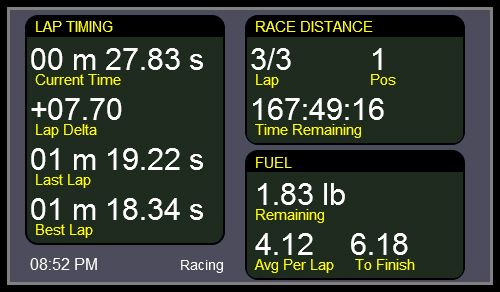 The left side of the screen displays lap time information. Starting from the top you have the current lap time of the current lap. Next is the current delta to your fastest lap of the session. This delta will reset each time you relaunch the sim if you turn off the Save Splits option in the General tab of the Settings Dialog. The third line displays the last lap time. Finally the last line displays the best lap of the session. The top right side of the screen displays the race information. During a race the lap counter displays either the lap you are currently on or the number of laps completed followed by the total number of laps in the race. You can choose the former setting using the Lap Counter drop down of the General tab in the Settings Dialog. During a non-race session the lap counter displays the total number of laps completed in the stint followed by the total number of laps completed in the session. Your current position, overall, is displayed to the right. The total time remaining in the session, or the race, is displayed on the bottom of this screen. The fuel section displays the amount of fuel remaining in your fuel tank along with your current average fuel consumption per lap displayed below. At the bottom right of this section is the amount of fuel you will need to finish the race. During a practice session this will display the amount of fuel required to finish the lap.